Ariana Grande during the One Love Manchester Benefit Concert at Old Trafford Cricket Ground on June 4, 2017. On Sunday night at the Old Trafford cricket field southwest of the city, Ariana Grande, Katy Perry, Justin Bieber, Coldplay, Miley Cyrus, Marcus Mumford, Take That, Robbie Williams, Pharrell Williams, Imogen Heap, Liam Gallagher (who afterwards lambasted his brother Noel for not attending the show, held in the town they were born and raised), former One Direction member Niall Horan, the Black Eyed Peas (without Fergie) and Little Mix took to a quickly constructed stage for a quickly organized benefit concert, One Love Manchester. Less than two weeks ago, a terrorist bombing took place outside of the nearby Manchester Arena, precisely timed to the ending of a concert by Grande that evening, killing 22 and wounding dozens. The concert also came one day after an attack at London Bridge killed seven and injured 48. 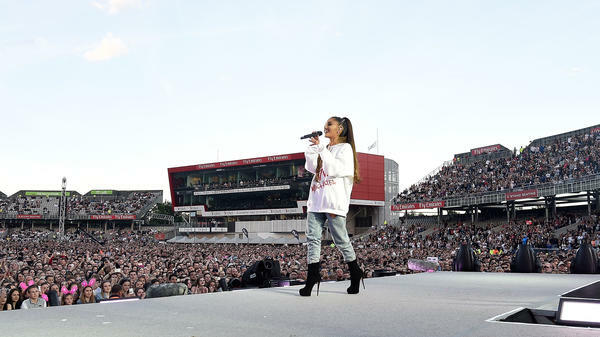 The concert, which sold out with an attendance of around 50,000, raised over $3 million for the Manchester Emergency Fund. Its broadcast drew the largest television audience of any program so far this year, according to The Hollywood Reporter, peaking with 14.5 million viewers, or 49.3 percent of overall viewers. The concert was also streamed online on YouTube, Twitter and Facebook (those viewership numbers hadn't been made available at the time of this writing). A Facebook spokesperson reports the social media giant's own had 76 million views, with a view being defined as three seconds or more being watched. The concert seemed a philosophical success, too, as Grande played host, criss-crossing the evening's lineup of musicians, all of whom pleaded the case for solidarity and love. Police danced with children. Justin Bieber, a guitar on his chest, led a chant of "love." Grande referenced the "medicine" being served that night. Katy Perry encouraged concertgoers to touch their neighbor to say "I love you." Coldplay singer Chris Martin sang the Oasis classic "Don't Look Back in Anger," as Grande smiled on. Grande performed the final song for the evening, a patient, minimalist rendition of "Somewhere Over the Rainbow." It was a perfect choice, thematically and musically, to close a concert so defiant and communal in aim and execution. Grande, her voice tired from the long evening, paused with tears in her eyes before the song's coda as the crowd, made up of people the same age as those who attended her concert in the area less than two weeks earlier, watched on — no doubt tired, but no less passionate for it. Updated, June 6, 9:16 a.m.: This article was updated with viewing numbers from Facebook, one of three streaming partners (along with YouTube and Twitter) of the concert.